Monterey served as the Spanish, then Mexican, capital of California between 1776 and 1848. A National Historic Landmark, the Monterey Old Town Historic District includes within its boundaries the Monterey State Historic Park. The district brings to life the Spanish Colonial, Mexican Colonial, and early American periods of California through its 19th century historic buildings. As a thriving port, Monterey became a bustling city as the social, economic, and political center of California. Self-guided and guided walking tours throughout the Monterey Old Historic District and the Monterey State Historic Park transport visitors back to early California and remind them of the historic Spanish and Mexican heritage that permeates the area. By the late 1700s and early 1800s, Spain had extended its New World empire by colonizing the west coast of North America. The Spanish created permanent settlements in Alta California by constructing presidios (forts) and establishing missions throughout the region. On June 3, 1770, Captain Gaspar de Portola and Franciscan Father Junipero Serra founded the Presidio of Monterey and the Mission de San Carolos Borromeo de Monterey at Monterey Bay. As the second of the four presidios the Spanish established in California, the Presidio of Monterey provided settlers and the mission with protection, and served as the military and government headquarters. The second in what would become a 21 mission chain in California, Mission de San Carolos Borromeo de Monterey moved to nearby Carmel in 1771, because it offered a better agricultural and political environment for the growing mission. The presidio remained in Monterey and flourished as the seat of government. Roughly 50 years after the establishment of Monterey, Mexico won its independence from Spain in 1821 and California pledged its allegiance to the Mexican government. For the next 25 years, Monterey served as the capital of Mexican California. During this time, Mexico lifted the strict trading regulations the Spanish had enforced, and Monterey became California’s main port of entry. British, American, and South American trading vessels flocked to this coastal port. The economy boomed and Monterey became a cosmopolitan town. Drawn to Monterey for its economic possibilities, foreign tradesmen, settlers, and businessmen settled in the area and often married into leading local Mexican or Californio families. Californio is a term used to describe Spanish-speaking people, regardless of their race, born in California before 1848. As Monterey’s economy expanded, so did the city itself. Beginning in the 1820s, Monterey grew beyond the old Spanish presidio walls becoming a tangle of irregularly laid streets lined with pristine, whitewashed adobe buildings. By the mid 1830s, a New England entrepreneur named Thomas O. Larkin introduced a new building style to Monterey by combining Spanish building methods with New England architectural features. This became known as the “Monterey Colonial” style. As the American presence in California continued to grow and California officially became part of the United States in 1848, American settlers introduced further refinements to the area’s architectural techniques. Introduced by American Gallant Duncan Dickenson in 1848, kiln-fired bricks became a part of Monterey’s architectural mix. The architectural styles found throughout the Monterey Old Historic District and the Monterey State Historic Park represent the city’s political, social, and cultural history. As Monterey evolved from a Spanish to a Mexican capital, and then to an American city, its diverse citizens found ways to adapt and blend architectural techniques to suit their needs and aesthetic preferences. The best way to experience the architectural styles of the Monterey Old Town Historic District is through a walking tour. The “Monterey Walking Path of History” is a historic two-mile path that includes 55 historic buildings and sites throughout the historic district and the park. Yellow-tiled markers set into the sidewalk help visitors follow this path. A good place to start a tour of old Monterey is at the Pacific House (200-222 Calle Principal at Scott Street), which the Monterey State Historic Park administers as a visitor center and museum. 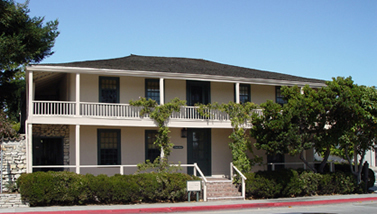 Constructed in 1847 for Thomas O. Larkin, Pacific House is an example of a Monterey Colonial style commercial building. The United States Quartermaster first rented the building for use during the Mexican-American War. After the war, in 1849, the house became a boarding house and salon and finally the main visitor center for the park. Right next door to Pacific House is Casa del Oro, also known as the Boston Store (200 Oliver Street at Scott Street). Thomas O. Larkin built this two story adobe building in 1844, which first served as a hospital for American sailors and then as quarters for American troops during the Mexican-American War. After 1848, David Jacks and Joseph Boston operated a general store named the Boston Store out of Casa del Oro. Today, Monterey’s Historic Garden League runs Casa del Oro as the Boston Store once again. Leaving Case del Oro or the Boston Store, visitors should walk to the First Theater (at the corner of Pacific and Scott Streets). Built by British sailor Jack Swan in 1846, the First Theater is a typical one-story adobe that initially served as a boardinghouse and saloon. In 1848, when the Mexican-American War was over, American servicemen from Colonel Stevenson’s 1st New York Volunteers used the adobe as a place to produce plays for a money making venture. They needed to raise money to travel home to the East Coast. While the price of admission was high, at the equivalent of about $5.00 per person today, they sold out most of their shows, providing much needed entertainment to the area. A short walk north from the First Theater is the Old Whaling Station (391 Decatur Street). Constructed in 1847 by David Wight as a home for his wife and daughter, the Old Whaling Station adobe eventually served as the headquarters and employee residence for the Old Monterey Whaling Company. The Old Whaling Station boasts Monterey’s only remaining walkway made entirely of whale vertebrae, reminding visitors of Monterey’s bustling whaling industry that lasted from 1850 until 1900. Walk carefully, because this sidewalk cannot be replaced. Right next to the Old Whaling Station is the First Brick House (351 Decatur Street). Gallant Duncan Dickenson, a member of the 1846 Donner Party of overland emigrants, built this home in 1847 using fired bricks. This building was the first in Monterey to be constructed of fire bricks, a technique that American settlers brought to California during California’s early American period. From the First Brick House visitors can walk east to the Old Custom House (115 Alvarado Street). The Old Custom House is a National Historic Landmark featured in this itinerary separately. In 1827, the Mexican government began construction of the Old Custom House, which was to be used as a place to collect custom duties from the merchants of California’s flourishing shipping trade. The Old Custom House is the oldest extant public building on the Pacific Coast and is an excellent example of Monterey Colonial public building architecture. At the Old Custom House in 1846, Commodore John Drake Sloat raised the American flag claiming over 600,000 square miles of territory for the United States. Leaving the Old Custom House, visitors can walk south for four and half blocks on Alvaredo Street to the Cooper-Molera Adobe (508 Munras Avenue). 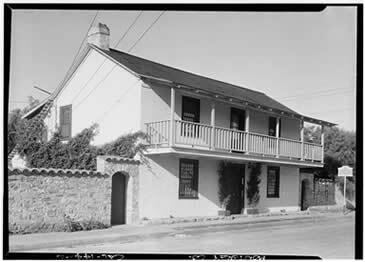 American sea captain, John Rogers Cooper, built this long, two-story adobe with a wooden balcony in 1827. Rogers found success as a merchant and prominent landowner in Monterey and convinced his half-brother, Thomas O. Larkin, to move to the area in 1832 in order to assist him in his business pursuits. Today, the National Trust for Historic Preservation owns the adobe, which the Monterey State Historic Park Association operates as a museum. From the Cooper-Molera Adobe, a stroll west on Polk Street take visitors to the Casa Gutierrez (590 Calle Principal-the corner of Polk Street and Calle Principal). Built between 1841 and 1842 by Joaquin Gutierrez, the Casa Gutierrez is one of the few remaining adobes constructed in the simpler Mexican style of buildings that once lined the streets of Monterey. Leaving Casa Gutierrez, walk north on Pacific Street to Colton Hall (570 Pacific Street). U.S. Navy Captain Walter Colton, appointed Monterey’s first American Alcalde or Chief Magistrate of the Monterey district in 1846, designed and supervised the construction of Colton Hall between 1847 and 1859. 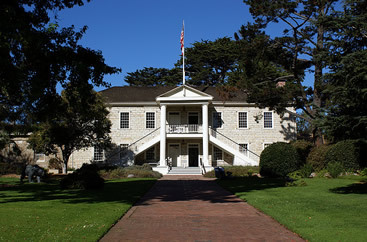 Colton Hall, the first public building constructed under the American flag in California and the first Greek Revival style building erected on the Pacific Coast, opened March 8, 1849 and originally served as a public school and government meeting place. It also hosted California’s constitutional convention during September and October of 1849. California’s first constitution was written and ratified here. Today, Colton Hall is open to visitors as a museum. Just behind Colton Hall is the Colton Jail, built in 1854, which is also open to visitors as a museum. After Colton Hall, visitors can make a stop at the Larkin House (510 Calle Principal). 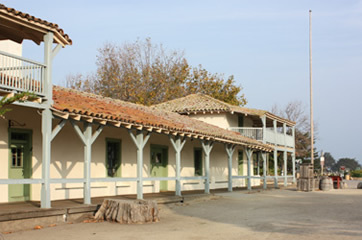 Thomas O. Larkin built this National Historic Landmark adobe between 1834 and 1847. This house served as the prototype of the Monterey Colonial architectural style that Larkin created by adapting east coast building techniques to the available materials in California. Finding too little timber to construct the entire home, he used readily available adobe along with the wood, masterfully melding Spanish and Mexican Colonial building techniques with those of New England. The new Monterey Colonial style became popular in Monterey and other parts of California. Visitors can tour the house and learn about Thomas O. Larkin and his influential architectural style. Leaving the Larkin House, visitors can continue to explore the over 50 sites on the “Monterey Walking Path of History.” A walk through the Monterey Old Town Historic District is a strong tangible reminder of the influence Spanish, Mexican, and early American cultures had on the development and construction of Monterey. Monterey Old Town Historic District, a National Historic Landmark, is located in two sections of Monterey, CA. The southern section is bounded roughly by the four blocks surrounding the intersection of Madison and Pacific Sts. the northern section borders on the bay and includes the blocks surrounding the intersections of Scott, Pacific, Olivier, Calle Principal, and Alvarado Sts. 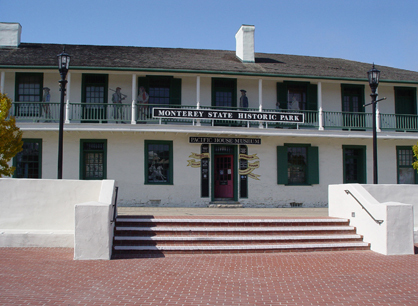 The Monterey State Historic Park has varying hours, please click here for an up-to-date schedule. For more information, visit the Monterey State Historic Park website or call 831-649-7118. The Monterey Old Town Historic District is featured in the National Park Service Early History of the California Coast Travel Itinerary. The National Park Service’s Historic American Buildings Survey has documented the Monterey Old Town Historic District.